Cork stoppers, a portrait, imagination. Scott Gundersen didn’t require anything else to conceive his works. He’s already on his third picture, but he doesn’t want to leave it there. He just needs everyone’s help to collect and send him cork stoppers. Can you summarise your path as an artist? Is producing these works your full-time job? I grew up in North-West Michigan, and I always loved building and drawing. After high school I headed to Western Michigan University in Kalamazoo to study art and education. For the past 10 years I’ve been teaching high school art, carving out a few hours a week during the school year to make my own art and a few more hours during the summer. How many pieces of “cork art” have you already done? “Trisha” is my third piece and the smallest of the three pieces I’ve created. 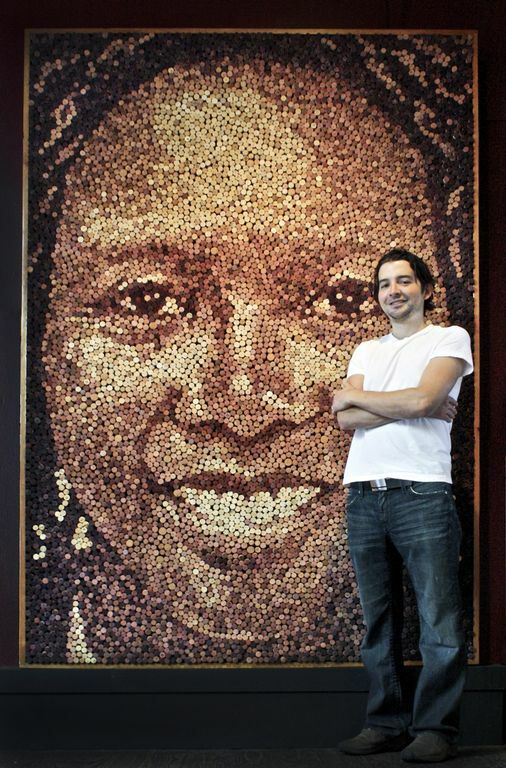 My first portrait in wine corks was of my wife Jeanne and used a total of 3842 wine corks. 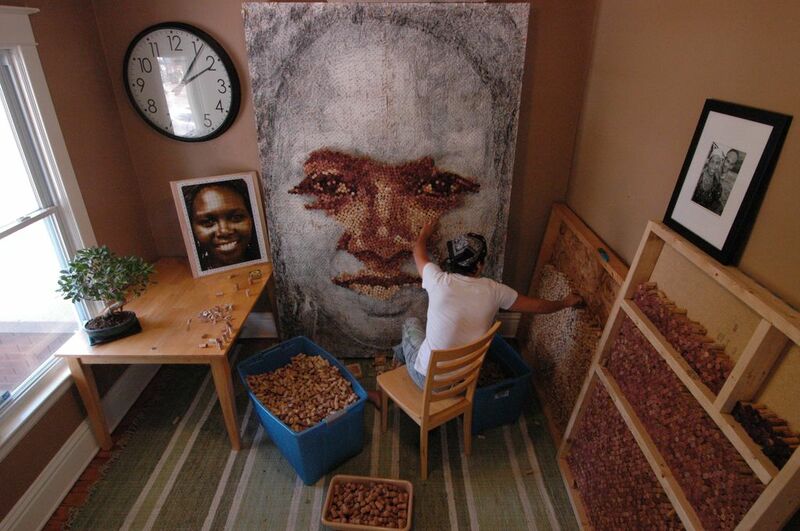 A year later I created a portrait of a friend from Rwanda, named Grace that used 9,217 wine corks. I’m in the beginning stages of creating my biggest piece yet, a self portrait that will probably require 12,000 to 15,000 corks. The bigger I create a piece, the more detail I can include. I like my smaller pieces a lot, yet they present many challenges in creating accurate and interesting portraits. How did you get the idea to use cork stoppers for your art? I produced my first portrait in 2009, however the idea came to me two years earlier, in 2007. I was traveling in Africa and the resourcefulness of the people I met inspired me. They made use of everything they had, reusing items that most people would consider trash. They recycled and created tools, clothing and art out these items. We could call this “up-cycling” in America, but it makes common sense to them to reuse objects. Their ingenious attitude made me think about what objects was I throwing out that I could use for my works. Drinking a glass of wine on my way home during the trip led me to wonder how I could create a portrait with cork stoppers. How long does your “average” piece take? It’s hard to say, but for a small piece like “Trisha” I would spend 2 or 3 weeks. Once the beginning part of the work is done (drawing the image, building the frame, etc.) the actual placement of the stoppers goes quite quickly. Can people hire you to make a piece of your art of them? What’s the average cost? I do occasionally accept commissions. 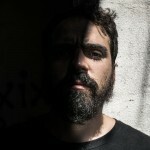 There are a lot of variables that determine the cost I charge for a portrait. If people are curious about commissioning or purchasing a future piece they can email ideas and questions to me at gundersen.scott@gmail.com. How do you get your hands on so many used cork stoppers? Each piece uses thousands of stoppers. For my first piece I collected stoppers for 2 years before I had about 5,000 corks to sort through to create my piece called Jeanne. People began to hear about my work and they began helping. The cork stoppers arrived faster and faster. Just this week a woman from England shipped a box of stoppers to me that she had been saving for years. A friend has also started a cork stopper recycling program at a local wine shop. Even with all the cork stoppers that I have coming in, I can always use more. How can people send their cork stoppers to you? Like I said, I always need more stoppers. If you know anyone who would like their cork stoppers to be a part of my next piece, have them email me so I can give details. I would love to send them a small signed print in exchange for their stoppers.